If you like large portions of chili or soup, our jumbo soup /chili bowl is for you. It is a 28 ounce bowl but holds about 40 oz to the brim. 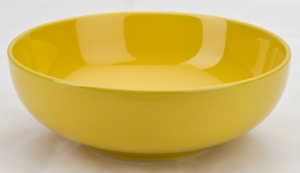 These are colorful soup bowls for hardy appetites with room for crackers. It stacks for storing and reheats chili easily in the microwave. Buy 2 and save 5% with Store Wide Discounts. Buy 4 and save 10% with Store Wide Discounts. Buy 6 and save 15% with Store Wide Discounts. Buy 10 and save 20% with Store Wide Discounts. Discounts calculated in shopping cart.